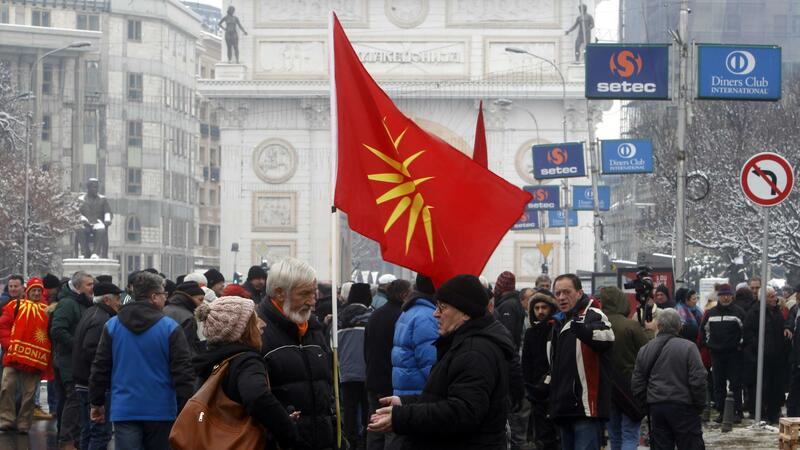 People gather outside the parliament building in Macedonia to protest the country's name change to North Macedonia. Macedonia's parliament has approved changing the country's name to North Macedonia, appeasing Greece and bringing the country one step closer to membership in NATO. Eighty-one of the 120 lawmakers in Macedonia's parliament voted on Friday to approve a constitutional amendment to change the country's name, NPR's Joanna Kakissis reports from Athens. The remaining opposition lawmakers stayed away in protest, according to Associated Press reports. The change won't be official until the Greek parliament approves it. Opponents of the deal protested outside the Macedonian parliament on Friday, responding to the vote with calls of "traitors," AP reports. Conservative opposition leader Hristijan Mickoski told reporters that the vote was "an act of treason." Macedonian Prime Minister Zoran Zaev agreed to rename the country in a compromise with his Greek counterpart Alexis Tsipras last June. The proposed name change weathered protests from nationalists in both countries — and a referendum in Macedonia that failed to meet the turnout requirement. The disagreement has sparked protests on both sides of the territorial boundary and produced real consequences: Greece has blocked Macedonia's entry into both NATO and the European Union. Greece had previously referred to Macedonia as Skopje, after its capital, or Fyrom, an acronym for the former Yugoslav Republic of Macedonia. NATO Secretary-General Jens Stoltenberg tweeted support of the agreement on Friday, calling it "an important contribution to a stable and prosperous region." A public referendum in Macedonia to change the name last September won overwhelming support but fell short of the 50 percent turnout required to validate the change, after protesters pushed for a boycott. "It is humiliating that I must not call myself a Macedonian, the only name I have for myself and for my ancestors and for my children only because of a political deal and diplomatic deal," one protester told NPR at the time.